The place in which the most important people in your lives are going to spend a large part of their own lives in should definitely be a special place. It is special to grow up in a place that looks like a small town, where you can open a gate and be in the forest and belong to a community where we all know each other. Where we learn, we have respect, we have fun and we get prepared to be happy. It is special to know that someone is concerned about them, both for what they are and what they will become, because everyone is good at something. It is only a matter of working out what that is and then having the resources and ability to ensure it will happen. It is special to have a state-of-the-art laboratory, to research and discover a vertical garden, to use interactive white boards. It is also special to live speaking in English, learning Spanish, Catalan, German and French in an international environment, making friends from around the world. A global vision encapsulated in a family-like environment. Below you may find the list of awards given to our students since 2008, year in which these awards started. We treasure each one of these since, statistically, we should only receive one of these every three or four years. 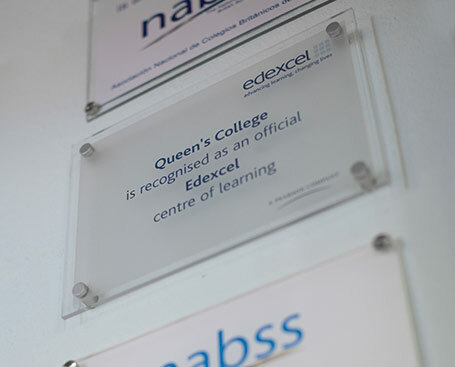 In the Secondary Department, students’ work is assessed on a daily basis, through teacher observations and effective questioning in the classroom. Work carried out both in school and at home is corrected, marks are awarded and feedback is given. Frequent tests are set, usually at the end on a unit of work. All marks are recorded on an ongoing basis so that students may check on their progress and improvement. Throughout the year students are encouraged by both subject teachers and tutors to set themselves targets and then work hard to achieve these. At the end of each academic year, students take an examination in each subject. At the end of Year 11, these same subjects at extended level, together with remaining subjects. University of Leicester Computer Science with year in Industry. The Queen’s College Sisu Award is presented annually to Year 13 students, in recognition of effort and perseverance. The award is based on specific results-based criteria. There is no limit to the number of awards available each year which means that all students who achieve the established objectives are rewarded. The award, apart from public recognition of qualities such as sustained effort and achievement consists of a monetary prize: the refund of 50% of the final year’s annual school fee (see below: Sisu Award Criteria). The origin of the award’s name: ‘Sisu’ is a Finnish term which, when loosely translated into English, means ‘strength of will, determination, perseverance, and acting rationally in the face of adversity’. Sisu does not imply momentary courage, but the ability to sustain an action against all odds. This award is presented to students who achieve the equivalent of 4 “A” grades at GCE “A” level and who have demonstrated the academic and personal qualities which make them excellent role models for younger students. The award comes with a percentage refund of Year 13 fees as specified below. 10% refund of fees (based on annual fee) for one year’s attendance at school. 20% refund of fees (based on annual fee) for two year’s attendance at school. 30% refund of fees (based on annual fee) for three year’s attendance at school. 40% refund of fees (based on annual fee) for four year’s attendance at school. 50% refund of fees (based on annual fee) for students who have attended the school for a minimum of 5 years.